I don’t think I could have been happier in any other profession. As a dentist, my greatest joy is my contact with people and contributing to their health and their confidence in their appearance. I’ve been a practicing dentist for more than 35 years, and am now seeing a 2nd generation of patients from the same families who started with me. What an honor it is that they trust me to care not only for their own dental needs, but those of their children, as well. As a dentist, I take pride in the fact that I, and the other doctors in the practice, don’t over-treat our patients. Instead, we do what is necessary, affordable, and will work best for each patient. By tailoring treatment paths to each person, we ensure the best care and treatment experience for them. I truly cherish the friendships and relationships that have grown between my patients and myself. They feel like an extension of my family and I look forward to their visits as a time to hear the latest news and share stories and laughter. Every year I take multiple continuing education courses in oral healthcare. This allows me to learn about new technologies and stay abreast of advancements in the field. Ensuring that my patients have access to the widest range of proven treatment processes and care options is essential: they trust me to provide the best care possible, and continuing education provides that. I am a mentor for doctors learning about CEREC® single-visit crowns, and I take courses and mentor each year through the Scottsdale Center for Dentistry. 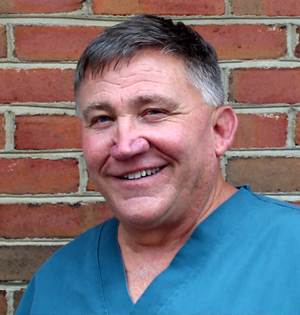 I’m am experienced in placing and restoring implants, and am pursuing courses on 3D imaging for dental implants. I’ve lived in Salem my entire life, except when I was away at school. My wife’s name is Cherry and I have a daughter, Wesley Anne, who is married to Dr. Kevin O’Brien. They are both dentists in the practice. Clark is my son, and we also have several beloved pets: Bridget, our dog, and Smokey, our cat. Away from work, being with my family is important to me. I also enjoy traveling, fishing, and golfing, and am an avid home cook, too. Being active in our community is essential. I was instrumental in the creation of the Salem YMCA and was involved with Boy Scouts for many years, as well as the Salem Rotary.